The beautiful Alhambra Palace, which overlooks the city of Granada from its position on Sabika Hill, is one of the best preserved medieval Islamic palaces in the world and the most visited monument in Spain attracting over 3 million every year. But before you read another word it is worth pointing out that, although there is a great deal of detailed historical information out there about the monument itself, the most important information that you need before you go is how to get hold of tickets and how to make the most of your time there. It is not the most user friendly process, but it is worth it. This stunning palace-fortress, declared a World Heritage Site by UNESCO in 1984, represents the last bastion of al-Andalus in Spain (Moorish rule that, at its zenith, claimed nearly the entire Iberian Peninsular) and once home to Catherine of Aragon. It was in 1492 that her parents King Fernando and Queen Isobel finally forced the Moors out of Granada and Spain. 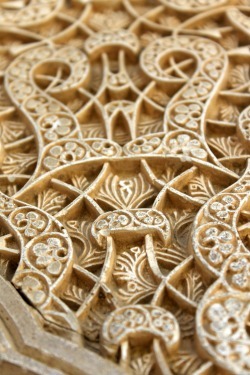 American writer Washington Irving wrote Tales of the Alhambra in 1832 after spending time there. It was a key work in popularising Granada and the Alhambra inspiring visitors from all over the world for generations to come. When planning how you are going to cover the ground at the Alhambra it is helpful to think of it in four distinct parts. The Generalife, located on Cerro de Sol, is accessed from the main entrance and, depending on your time slot for the Nazrid Palaces is a good place to start your tour of the Alhambra. It features the Summer Palace of Granada’s Rulers and a complex of multi-leveled patios, walkways, fountains and walled gardens. It is a wonderful, tranquil place to while away an hour or so strolling along the paths and catching glimpses of the main Alhambra buildings, the city and the mountains as you go. You will also find plenty of shady spots for a picnic here. It is the ornate Nazrid Palaces Palacios de Nazaríes that attract the most visitors and for that reason, to protect the monument itself, visits are limited and time allocated (a maximum of 300 people admitted each half an hour). Your Alhambra visit should be planned around the time slot that is allocated to you on your ticket. For more on booking tickets and planning your visit see the Red Tabs below. The Nazrid Palaces were built simply of wood, brick and adobe. They were not intended to endure, it is amazing that they have, but rather to be renewed by future rulers. This simplicity in construction was also in line with the idea that nothing man made should compete with Allah’s creations. The main features of La Casa Real are the Palace of the Mexuar (the oldest), the Palace of Comares, which was the official residence of the Sultan, and the Palace of the Lions, viewed as the pinnacle of Nasrid art. Emperor Carlos V was the Grandson of Isobel and Fernando. In 1526, as a symbol of the triumph of Christianity over Islam, he destroyed a whole wing of rooms to build himself a palace. Despite being a fine example of Renaissance architecture, it seems rather out of place within in its Moorish surroundings and is perhaps not so much loved as a result. The work was never completed. The Palacio de Carlos V also houses the Museum of the Alhambra and the Museum of Fine Arts (closed on Mondays). This fortress, mostly in ruins now, is the oldest part of the complex dating back to the 9th century. It is from this ‘Red Fort’ that the name Al Qal’a al-Hambra came. Ibn al-Ahmar, the first Nazrid king, rebuilt and added to the fort and famously diverted the river Darro to the foot of the Alhambra Hill. It is well worth the climb to the top of the Torre de la Vela from which point you have 360° view of the mountains, the vega, the city, the Albayzín and Sacromonte. Much like packing to go away, when you will fill whatever size suitcase you are taking, visiting the Alhambra and Generalife will fill whatever time you can afford it, whether that be a morning or a month. The average visit is said to be 3 hours. At the risk of making it sound like a military operation, visiting the Alhambra complex demands just a little bit of thought before you go. You need a plan of attack! Click on the Red Tabs below for some essential information and really useful advice that will help you get the best out of it. Please also see the map at the bottom of the page which will help you to get your bearings. It is possible to buy tickets on the day at the ticket office or the Servicaixa ATMs at the main entrance. The queues are always long but if you arrive early enough, before 08.00, you might get lucky. You can purchase a maximum of 10 tickets up to three months in advance. You will be asked to select a morning or afternoon visit and then your choose your Nazrid Palace slot. Tickets can be purchased online at Ticketmaster and all major cards are accepted. A booking fee of €1.30 applies. You can purchase a maximum of 10 tickets up to three months in advance. You will be asked to select a morning or afternoon visit but your Nazrid Palace slot will be allocated to you. Call 902 888 001 from Spain or +34 934 923 750 from outside Spain. All major cards accepted and a booking fee of €1.00 applies. You can buy and collect advance tickets from Servicaixa ATMs cajeros. These can be found at the Main Entrance of the Alhambra or at three branches of La Caixa bank located in the city: Calle Acera de Darro, Calle Alhondiga and Avendia Pablo Picasso. You can find Servicaixa ATMs in other cities using their branch locator. When using this service be sure to search for branches that offer the ticket sale and collection service Venta de Entradas. Tickets may be collected from 08.00 on the day of your visit at the ticket office on site. You will need to present your ID/passport and the purchasing credit/debit card. It is also possible to collect your tickets from the yellow Servicaixa ATMs found in locations around the city (see map below) or found at the entrance of the Alhambra on the day of your visit. You can also print your prepaid tickets from the machine at the La Tienda de la Alhambra on Reyes Católicos, 40 in the centre of town. NOTE: this option is only open to you if the purchasing credit/debit card was issued in Spain. All others must go to the ticket office. If all of the above ticket-buying rigmarole sounds a bit arduous and you would enjoy a guided tour there is another option. You can book a guided tour of the Alhambra which includes admission and a guided tour, with headset for the commentary, of the Alhambra and Generalife. Even though children (under 12) can enter free of charge they still require a ticket and proof of age may be required. Tickets cannot be changed, returned or refunded. Hold on to your tickets throughout as they will be scanned several times during your visit. If you are coming from outside the city and arriving by car the route from the motorway is relatively simple and well signposted. 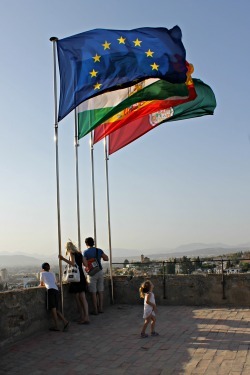 From the A-44 take exit 132 for Ronda Sur, keep left and continue on the A-395 and take signs for the Alhambra. Car parks are on the right hand side as you approach the main entrance (Generalife). Please click here for an interactive map to work out your route and drive times. From Plaza Nueva take Cuesta Gomérez (opp fountain) 15 minute walk uphill. From Paseo de los Tristes take Cuesta de los Chinos. From Plaza del Realejo take Cuesta del Realejo. It should cost you around €10 in an official Granada taxi from the Albayzín and most central city locations to the Alhambra. Look out for a white car with a green stripe running diagonally across the front door and a green light on the roof. Taxi stands at the site can be found opposite the church of Santa Maria of the Alhambra, hotel Alhambra Palace, Gate of the Generalife. The Alhambra buses C3 and C4 are highly visible red and white minibuses that run services daily (weekends and holidays included) between 07.00 and 23.00. The fare is €1.20 unless you invest in a Travelcard. More info on this and Granada Buses can be found here. 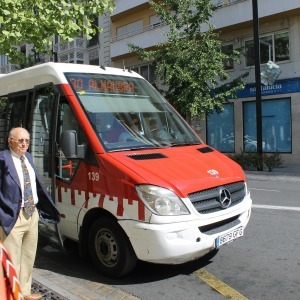 Routes C3 (Monday to Saturday, every 5 minutes from 07.00-23.00) and C4 (7 days a week, every 30 minutes from 07.00-22.00) run from Plaza de Isabela La Catolica via Cuesta del Caidero to Alhambra-Generalife. From Granada Bus station – Catch the N4 and then change to the LAC at Cruz del Sur. Get off at Catedral on Via Colon and from there it is a short walk to Plaza de Isabela La Católica to catch the C3 or C4 to the Alhambra. From Granada Train Station – Take LAC at Andaluces on Avenida de Constitucion (walk straight on as you exit the station for less than a minute) for a short ride to Gran Vía-Catedral. From there walk to Plaza de Isabela La Católica to catch the C3 or C4 to the Alhambra. The last visit to the Nasrid Palaces is one hour before the closing time. Your arrival time to the monument should be based around the time slot that you have been allocated to enter the Nazrid Palaces. This 30 minute slot is allocated when you buy your tickets. It is worth emphasising that a morning ticket allows you entrance at 08.30 and an afternoon ticket starts at 14.00. If, for example, your Nazrid Palace time slot is 17.00 you do not have to wait until then to enter the whole complex. If you are collecting your tickets on the day you go straight to the Main Entrance and arrive at least an hour before the time shown on your ticket. Bear in mind that it is a 30 minute walk from the main entrance to the Nazrid Palaces. Unfortunately, because of the high volume of people passing through, if you miss your time slot you will not be admitted to the palaces. If you already have your tickets and have a very early time slot to visit the Nazrid Palaces, or have just decided that they will be your first point of call, you can enter from Puerta de la Justica. It opens at 08.30 and is only a 5 minute walk from the Palaces. If you are cutting your arrival at the Nazrid Palaces a bit fine, check with attendants at the front of the queue as it may be that others in the queue are already there waiting for the time slot after yours. If you are not sure just show an attendant your ticket. There are number of ways to approach your visit and it all depends on your ticket type and allocated time slot for the Nazrid Palaces. Alhambra Gardens tickets: access to everything apart from the Nazrid Palaces (a good option if there are no slots left for the Palaces)Alhambra Experiences: evening visit plus access to the gardens the following morning. If your allocated time is first thing in the morning, and you have already have your tickets in hand, you can enter through the Puerta de la Justica (see map) rather than through the main entrance. This will save time as the Palaces are only five minutes walk from this entrance. This is also recommended for those with reduced mobility who want to start their visit at the Palaces. Those who have been allocated a later time can be a bit more flexible about the order in which they visit the various areas of the Alhambra. If you have at least an hour and a half in hand before your time slot it makes good sense to visit the Generalife first, as it accessed as soon as you come in the main entrance. From the gardens you will see many views of the Alhambra buildings opposite which helps you to gain a sense of the size and layout of the whole complex. After the walking the Generalife circuit cross the bridge and stroll down the Calle Real de la Alhambra towards the palaces. 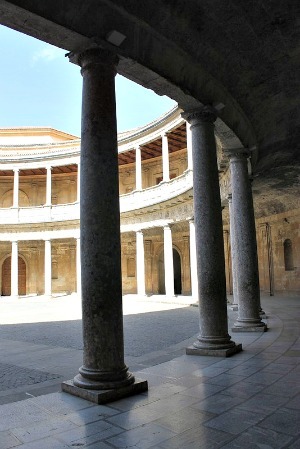 A logical route, in terms of covering the most ground with the least footsteps, would be to visit the Palacio Carlos V first, then the Alcazaba, followed by the Nazrid Palaces and finally the Partal. However, if you have the time, you might consider saving the Alcazaba until the end. If you have an afternoon ticket climbing the Torre de la Vela, and taking in the views of the city and mountains as the sun is lowering in the sky, is a great way to end the day. 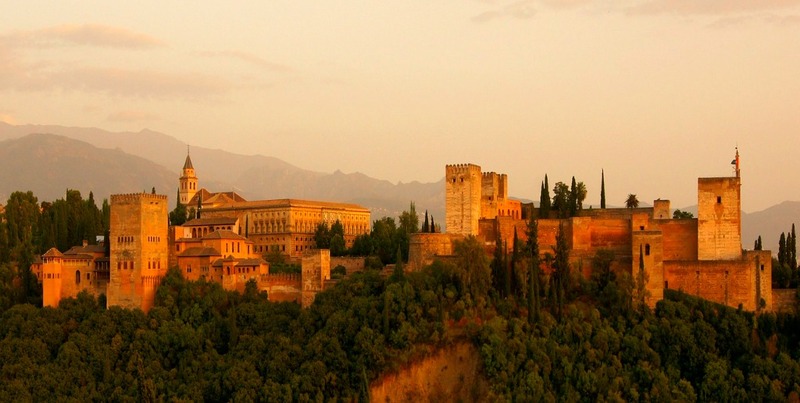 Wherever you choose to stay in Granada you are never too far from the Alhambra and many of the city hotels boast fantastic views of the monument. Here we have selected six great hotels that are situated close by, but if you would like to widen your search please visit our Hotels Section. For the very best location and historical setting the luxurious Parador San Francisco de Granada, set in the Alhambra grounds, is the ultimate choice. You should book well in advance as this hotel is much in demand. Just across the road, outside the complex you will find great value and service at the Alixares and Hotel Guadalupe. 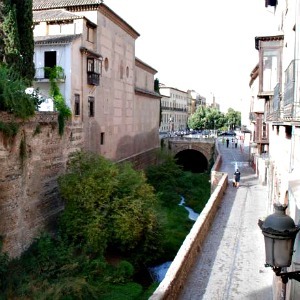 Ten minutes walk from the main entrance is the Alhambra Palace and further down the hill on the famous Carerra del Darro we would recommend El Ladrón de Agua and Palacio de Mariana Pineda. 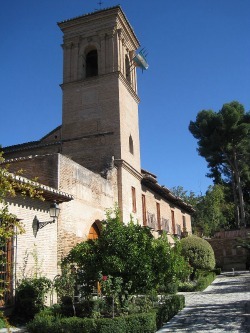 You will find more details about hotels near the Alhambra here. There are food and drink vending machines by the entrance and within the Alhambra walls, near Puerta del Vino which is at the the other end of the complex before you reach the Alcazaba. Close to this there is also a little shop selling souvenirs and over-priced helados. Here are a few better options. And when the quality of the food, ambiance and the location is taken into consideration they are far better value than what you would get from the vending machine. Set with in the Alhambra itself in the 15th century San Francisco convent, this fabulously luxurious hotel boasts a great restaurant where you can sit out on the terrace overlooking the Alhambra’s gardens. This is a fantastic place to take a late lunch after a morning tour of the monument or to relax after an afternoon visit. It is open to non-residents and serves a range of traditional Andalusian cuisine such as Gazpacho Andaluz, Tortilla de Sacromonte, Pollo a la alpujarrena and Habas y jamón de Trevelez. They also serve a pretty good burger. Located in the woods just outside the Alhambra on the Paseo del Generalife, this restaurant which has a large outdoor dinning terrace, couldn’t be more convenient pitstop. La Mimbre, which first opened its doors in 1890, is a great spot to have some lunch before an afternoon tour of the Alhambra especially if you are arriving early to pick up your tickets. The other option is to end up there and rest your feet for relaxing long lunch or some early evening tapas after your visit. Also fantastically situated close to the Alhambra on Paseo de la Sabika, this is another great spot where the food comes well recommended and you can enjoy a long leisurely lunch. The staff are efficient and friendly and sensitive to the fact that some diners may be on an ‘Alhambra timetable’.